Jimena in Oberlinden, in the old city of Freiburg. Jimena was recently in Freiburg im Breisgau, Germany, attending a workshop on trap-nest food webs (host-parasite interaction networks involving wood-nesting hymenopterans). The workshop, organized by Jochen Fründ, Alex Klein and Teja Tscharnkte, involved colleagues from Germany, Switzerland, Canada, the US and Argentina. It was held at the Waldhof, a quiet place ideal for this kind of activities in the Littenweiler area of Freiburg. Jimena also spent a few days as a guest researcher at the Freiburg Institute of Advanced Studies (FRIAS) at the University of Freiburg, where we worked together on a couple of manuscripts. It was really nice to have her here! Some of the many pollen grains transported by pollinators that were observed during the study. A paper on the influence of exotic plants on the pollination niche overlap among plants in an agroecosystem was just published in Agriculture, Ecosystems and Environment. The study, which is part of my PhD thesis, focuses on pollinator-mediated interactions among plants. The idea was to evaluate the transport of pollen by pollinators in agricultural and restored ecosystems, and how exotic plant species can disrupt such transport by increasing niche overlap among coexisting plant species. In doing so, we described for the first time a community-wide pollen transport network in an agroecosystem. The study involved many hours of laboratory work due to the difficulty of determining and counting the pollen grains carried by pollinators. But it was worth the effort, as the results were very interesting: we found that the diversity of pollen transported by pollinators and the overlap in the pollination niche among plants were greater in agricultural sites than in restored sites. Exotic plant species contributed positively to an increase in niche overlap, while native species contributed negatively, promoting decreased overlap. These results may be useful to improve our understanding of the ecology of pollinator-mediated interactions among plants, and of how alien species may disrupt the functioning of interactions among native species. You can find the final version of the manuscript in the journal`s web site, or send me an email at hugomarrero[_at_]gmail.com to request the pdf. Taking advantage of the great flexibility of CONICET’s post-doctoral fellowships, Lupe is spending several months in New Zealand collaborating with Daniel Stouffer and his group at the University of Canterbury, Christchurch. She will continue with her work on dynamic models of mutualistic networks that include not only benefits but also costs of interactions, and is starting other collaborations with some of Daniel’s group members. Good luck Lupe in this new Kiwi adventure! We heard last week that Hugo’s application to become an Assistant CONICET Researcher has been approved. He will be working at the Center for Natural Renewable Resources of the Semi-Arid Zone (CERZOS), in Bahía Blanca, in the south of Buenos Aires Province. During the first several years as a CONICET researcher, Hugo is planning to focus on the management of floral and nesting resources for native bees in agro-ecosystems to enhance crop pollination. Congratulations Hugo! One undergraduate and three doctoral theses by lab members have just been submitted for evaluation. Juan Manuel Drack turned in his undergraduate thesis, a study of the effects of cement dust produced by a cement factory on the morphology of a cactus. Belén Maldonado’s doctoral thesis is an investigation of the ecological functions (seed dispersal, nutrient cycling) performed by an assemblage of dung beetles, and how these functions change along an aridity gradient. Ana Mazzolari’s doctoral thesis is an analysis of the ecological factors that influence the invasion by two rose species (Rosa canina and R. rubiginosa) in the Province of Mendoza. Finally, Nydia Vitale’s doctoral thesis is a comparative study of the ecology of solitary carder bees (genus Anthidium in the family Megachilidae) in the Villavicencio Nature Reserve, Mendoza, and their potential response to climate change. An excellent sample of the breadth of ecological topics studied in our group. Congratulations to all four! This is the product of years of passionate hard work. Now to relax, wait for the reviews, and work on publishing the chapters! Stay tuned for news about the defenses! I will be spending a sabbatical year (ten months, actually) at the Freiburg Institute for Advanced Studies (FRIAS), at the University of Freiburg, in Freiburg im Breisgau, Germany. I will be there thanks to the generosity of my home institutions, CONICET and National University of Cuyo, which will keep paying my salary, and to a Marie Sklodowska-Curie FCFP Senior Fellowship. I will also spend short periods at iDiv, a biodiversity research center in Leipzig, where I hope to collaborate with my colleague Tiffany Knight, thanks to a Friedrich Wilhelm Bessel Research Award from the Humboldt Foundation. During my sabbatical, I hope to work on the analysis of data on plant-pollinator interactions and bee demography generated by my research group during almost a decade, and to establish collaborations with my many excellent colleagues in Germany and elsewhere in Europe. Natalia Schroeder will spend three months at the Forestry and Range Sciences Laboratory, Pacific Northwest Research Station of the Forest Service in La Grande, Oregon, USA. She will be collaborating with Michael Wisdom, Mary Rowland and Ryan Nielson in her ongoing research on spacial dynamics and management of large native and domestic ungulates, and will start new studies comparing ungulate species in North and South America. Her stay in Oregon will be generously supported by CONICET, a post-doctoral fellowship from the US Forest Service, and the Williams Foundation. Safe travels, Nati! An outdoor discussion during the first day of the retreat. 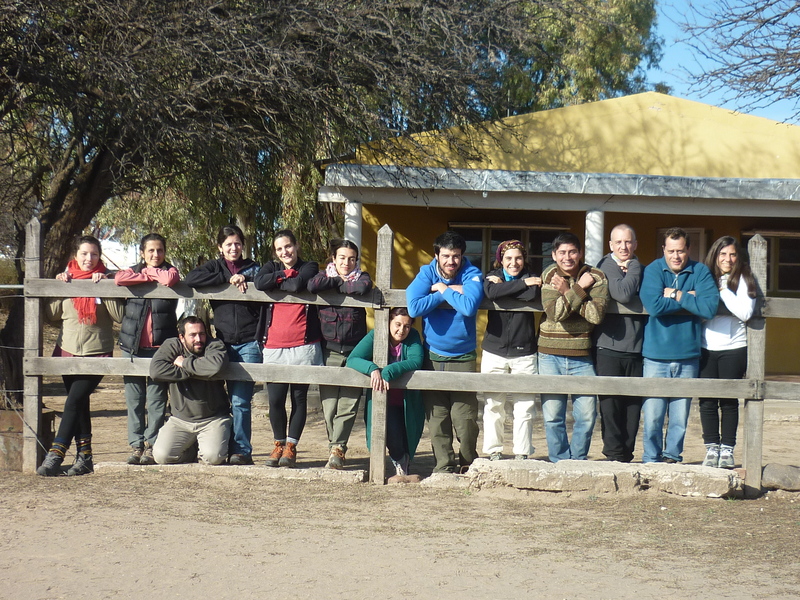 We are back from our second annual group retreat, held at the Biological Station of Ñacuñán Biosphere Reserve. Following the success of our first retreat last year, we decided to establish the group retreat as a yearly activity. The idea is to have a couple of days of close academic interaction in a quiet, remote setting surrounded by nature—the kind of place we ecologists love. And of course, to have fun together. 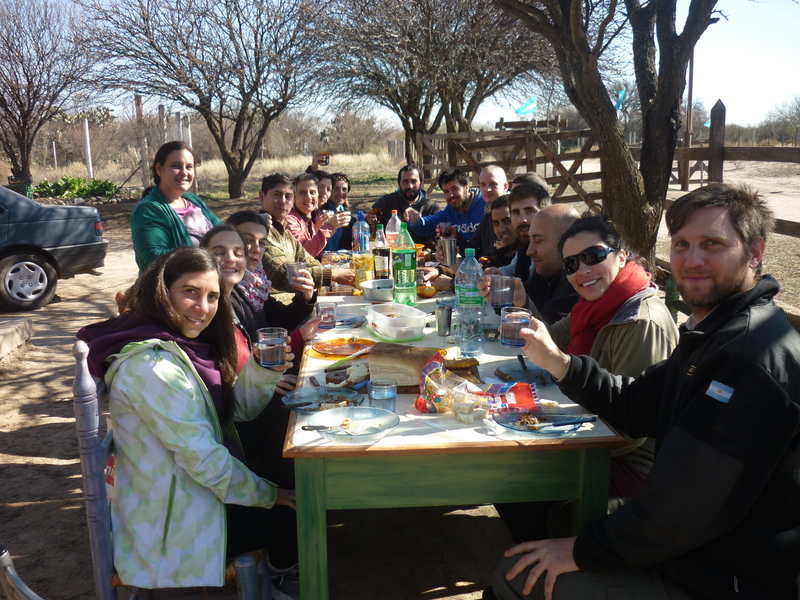 We were thirteen participants, including eleven members of our group in Mendoza and two visitors from Córdoba (Julia Tavella and Luciano Cagnolo). During the retreat, each of us gave a 15 min talk about either our own research or other ideas we wanted to share with the group, always with lots of time for questions and discussion, and generous breaks for informal interaction. 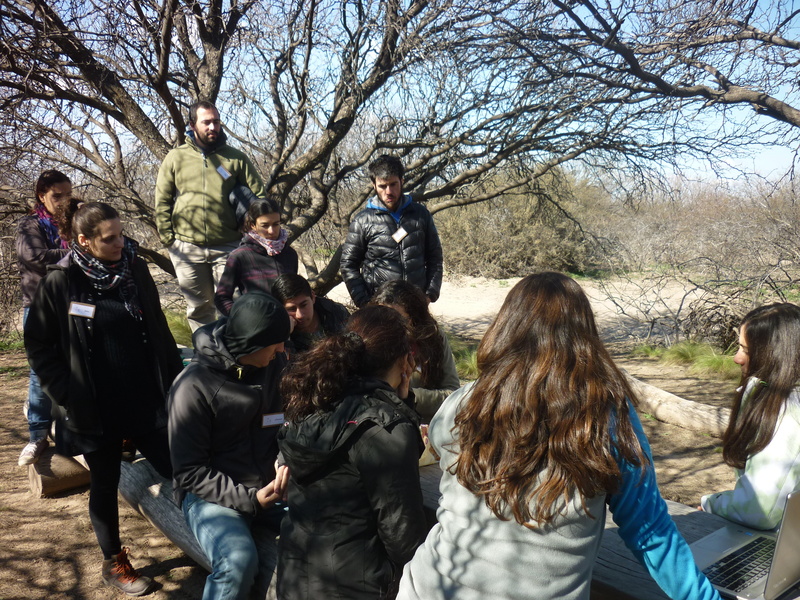 We also did a hike to Ñacuñán’s sand dunes, which was a nice opportunity to revisit field sites for some of us, and to see a representative part of the reserve for others. In the evening of the first day, there was time for tabletop games, and, for the younger members of the group for whom sleeping doesn’t seem to figure among their bodily needs, dancing. During lunch before our return to the city, we had an interesting exchange with the Reserve’s park rangers. 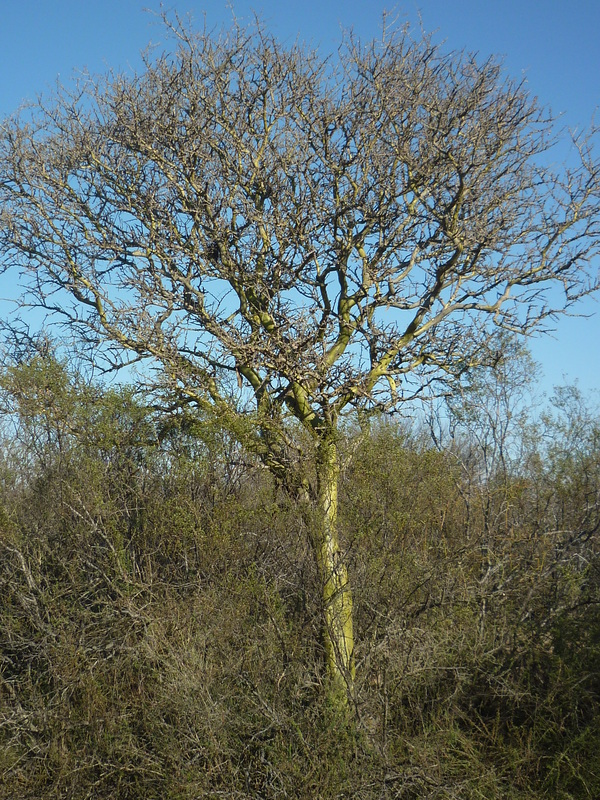 Chañar (Geoffroea decorticans), one of the few tree species in Ñacuñán. The setting of the retreat was great. Ñacuñán is a 12,000 ha Man and Biosphere Reserve located in eastern Mendoza Province, at the heart of the Monte desert. Although it can be quite hot in the summer, the winter is usually cold in the nights but lovely during the daytime, especially if sunny. The biological station consists of two houses, one for the Park Rangers and one for researchers, and a meeting room, which is sometimes also used as lab. All in all, it was a great experience that will surely instill us with renewed energy to continue doing great ecological research. The retreat’s participants. From left to right: Ana Mazzolari, Natalia Schroeder, Hugo Marrero, Belén Maldonado, Julia Tavella, Guadalupe Peralta, Nydia Vitale, Ramiro Ovejero, Micaela Santos, Juan Manuel Drack, Luciano Cagnolo, Diego Vázquez and Jimena Dorado. Sharing lunch under the shade of algarrobo trees with the Reserve’s park rangers. A female solitary bee Megachile leucographa building a nest in one of our wooden trap-nests. A paper evaluating whether diverse flower communities favor pollinator reproduction just came out in PeerJ. This paper came out from my PhD thesis, in which I was mentored by Diego Vázquez. We had previously found that diverse flower communities are more stable in floral resource production along the flowering season, but the question of how the diversity and stability of resources affect pollinator reproduction remained open. You will find here some unexpected, intriguing results! Check it out! Valeria Aschero and Diego Vázquez working in Ñacuñán Biosphere Reserve. See Aschero et al. (2016) Forest Ecology & Management, Aschero et al. (2009) Austr. Ecol. and Vázquez et al. (2008) RSEA. I have recently published a paper in Forest Ecology & Management aimed at studying how ungulates influence plant demography and population growth in different consecutive phases of their life cycle. For my PhD thesis (defended in 2011) I wanted to use a holistic approach to evaluate the demographic consequences of contrasting land use for the conservation of the desert tree Prosopis flexuosa (algarrobo dulce). One of the key things I had to learn for this project was how to use matrix population projection models, which gave me some headaches (I even had a dream in which I shared a cruise with the author of a renowned book on matrix models). This paper is the “cherry on the cake” of my PhD project, because it combines extensive observational and experimental data on the demography of P. flexuosa with matrix modeling to answer the question of how contrasting grazing regimes influence the demography and population growth of this species. Publishing this paper would have never been possible without the cooperation of my coauthors (Bill Morris, Diego Vázquez, Juan Álvarez and Pablo Villagra), who have kindly and patiently supported me, understanding my single mother timing and my enthusiasm to get into new intellectual adventures!